Cruises R Fun! 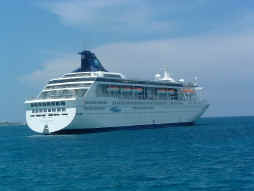 - Reviews of Cruise Lines, Cruise Ships, Destinations, Ports And More! Cruise Reviews of our cruises aboard the Carnival Spirit, Sapphire Princess, Oosterdam, American Queen, Crown Odyssey, Millennium, Norwegian Sea, Caribbean Princess and others. Check out all of our cruise ship vacations and see what goes on the various cruise ships and cruise ship lines before you decide which cruise lines you want to cruise on, and which ports you want to visit. As you've probably already guessed, cruises are our favorite way to vacation. In our opinion, there's no better way to visit the world's most beautiful cities and destinations. And you only have to unpack your bags once! The first of our cruises was a delightful trip up the Mississippi River in the American Queen river boat. The American Queen is the biggest paddle wheeler ever built. We started in New Orleans (where we spent three wonderful days beforehand) and made stops in Baton Rouge, Natchez, Vicksburg, the Oaks Plantation, and finished up in New Orleans. This was our honeymoon trip and we had a fabulous time. It's a small review, but after all, we were on our honeymoon! The Mediterranean Greek Isles on the Orient Line's Crown Odyssey. The Orient Line's Crown Odyssey holds 1,026 passengers and about 470 crew.... needless to say the service was superb. (perhaps a little too good in the ship's casino, where drink after drink was served with a smile). The cruise began in Athens stopping at Mykonos, Delos, Santorini, Rhoades, Kusadasi, and finishing up at Istanbul. This was our first "Mediterranean cruise", and what a cruise it was! It was very exciting seeing sights like the Parthenon atop the Acropolis, and the hill where Socrates drank the poison! The ancient ruins in Kusadasi (Ephesus) are absolutely incredible. Just think, Cleopatra and Mark Anthony were tourists here just like us! And the apostle Paul tried to address the Ephesians and was not allowed to so he wrote his famous letter which became the book of Ephesians in the bible. There is even a public rest room that had about twenty seats side by side carved into a long marble slab. Celebrity lines - Mediterranean Cruise on the Millennium! On this Mediterranean cruise we started in Istanbul, stopped in Kusadasi, Cyprus, Alexandria (Egypt), Athens, Naples, Rome, Nice and finished in Barcelona. Tours were well organized and enjoyable with the highlight of the trip a bus caravan to the Pyramids in Cairo. Our Baltic Sea Vacation On Holland America Lines' Oosterdam. What a cruise! Imagine, a McDonalds at red square! This was our first cruise to Europe, and we will be going back in the future for sure. London was great. In fact all of the stops were simply wonderful. I loved hearing all the history behind all of our ports of call. The ship was fantastic. We are impressed with Holland America Lines. Western Caribbean on the Norwegian Sea...a real adventure! Of all our vacations this one was the most active. Riding ATV's through the jungle, swimming with dolphins, inner tubing through under ground caves. We just had a great time. What a vacation that was! Every place we visited was amazing. Never have we met such polite and helpful people as in Osaka Japan...and no tipping. We've been to the fish market in Pusan Korea, at Ground Zero where the atomic bomb was dropped in Nagasaki, Japan, and in a Fort in Vlodovlastik, Russia.. (Siberia) We've walked on the Great Wall of China, strolled through the Forbidden City, and visited Tiananmen Square. All from the comfort of our cruise ship, the Sapphire Princess. Thumbs up! Cruising had a new wrinkle for us this year. We adopted two kittens, Sam and Molly, in January, so we faced what many cruisers do, what do we do with the cats for 10 days. We don't have any family nearby that we could strong-arm into looking after them, so I began my research into the best alternatives. My first thought was to kennel them at the Veterinarian, where they would be well looked after by an professional staff. I looked into this and found that the going rate was $30 - $35 a day per cat. Steep but doable, however I didn't like the idea of a cage for 10 days. Upon further investigation, I found the Cat's Pajamas B & B Cat Boarding Portland Oregon area . So Sam and Molly will be spending the 10 days in the French Bunny suite with a trained staff to care for them. You will note the price is much better than the vet .. this suite is actually $35 a day for the first cat and $15 for the second cat.